Synopsis : Portable wheelchair scale with easy roll-on weighing includes BMI, reweigh and hold functions, and EMR-ready with an RS-232 port. A new, fully portable wheelchair scale that can be easily transported to a patient for easy roll-on weighing and lets users manually enter the tare weight of the wheelchair, has a BMI (body mass index function), and reweigh and hold functions, along with an EMR-ready with an RS-232 port. The fully portable wheelchair scale can be easily transported to a patient for easy roll-on weighing and then folds for easy storage is being introduced by Alliance Scale, Inc. of Canton, Massachusetts. Fully portable wheelchair scale features roll on ramp and folds for easy storage. The Alliance/Rice Lake Portable Wheelchair Scale is a mobile patient weighing system that includes a large 29.5" x 32" non-skid platform, two wheels for ease of movement, and folds for easy storage. Featuring a full 1" LCD display, this high-capacity scale lets users manually enter the tare weight of the wheelchair, has a BMI (body mass index function), and reweigh and hold functions along with an EMR-ready RS-232 port. Providing a 1000 lb. x 0.2 lb. (450 kg x 0.1 kg) capacity with lb. only, kg. only, or lb./kg. functions, the Alliance/Rice Lake Portable Wheelchair Scale has an internal rechargeable battery, includes AC adapter, and updatable firmware. The standard model has one built-in ramp and a single handrail; dual ramp models and dual ramp models with two hand rails and a fold away chair with back rest are also offered. 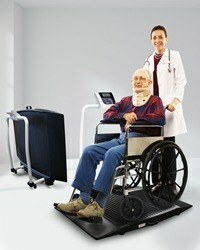 The Alliance/Rice Lake Portable Wheelchair Scale is priced from $995.00 up. Literature is available upon request. *News Release by Alliance Scale, Inc. : Disabled World makes no warranties or representations in connection therewith. PR content may be edited for style, clarity, and/or length. If you are connected with this page and want it corrected/updated please contact us. Citation: Alliance Scale, Inc. . (2017/08/17). Folding Portable Wheelchair Scale With Ramp. Retrieved 2019-04-20, from https://www.disabled-world.com/assistivedevices/medical/wheelchair-scales.php Direct Link: Folding Portable Wheelchair Scale With Ramp - Portable wheelchair scale with easy roll-on weighing includes BMI, reweigh and hold functions, and EMR-ready with an RS-232 port - Alliance Scale, Inc.